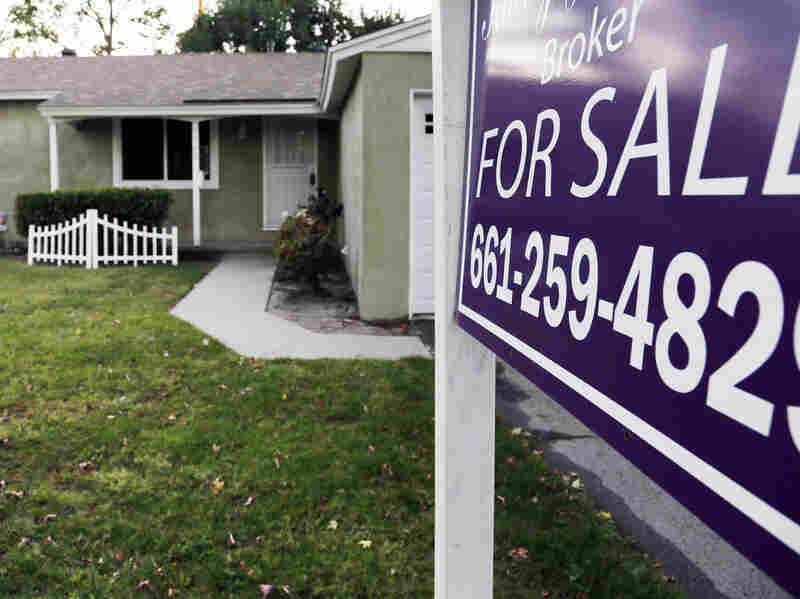 Consumer Agency Launches Tool To Help You Find A Cheaper Mortgage For many Americans, buying a house is the biggest financial transaction of their lives, but a new federal report says half of buyers don't shop around for a better interest rate on their mortgage. A sign announces that a Los Angeles house is for sale in November. Many Americans love a good deal, shopping around to save $10 or $20 on a pair of pants or winter coats for the kids — but when finding mortgages, nearly half don't even call around to different banks. Three-fourths only fill out an application with one lender. Richard Cordray, head of the Consumer Financial Protection Bureau, says there may be a few reasons consumers aren't comparison shopping for loans. "It is a surprising finding, and it suggests that they're still fairly intimidated by the mortgage transaction," he says. "Or they're a little distracted because, at the same time, they're picking out a house." But Cordray explains how costly the oversight can be, using as an example a $200,000 loan at rates of either 4 percent or 4.5 percent. "The difference in even a half percent of interest racks up pretty quickly over five years to about $3,500 — and over the life of a 30-year loan, obviously, far more than that," Cordray says. "So this is real money for people — meaningful money." In response, the Consumer Financial Protection Bureau is launching a set of online tools today to make these comparisons and decisions easier for U.S. homebuyers. One, for instance, will let a user plug in their credit score and ZIP code to generate a range of interest rates being offered by lenders that day. But there may be psychological hurdles to overcome as well as the informational ones, says Brigitte Madrian, a Harvard economist who studies how human nature gets in the way of us making better financial decisions. The first is that buyers fail to recognize the huge difference that a small number like half of 1 percent can make over time. "Consumers don't really understand compound interest. This has been documented in lots of different research studies," Madrian says. Those small percentages, when factored in again and again, have an immense cumulative effect: Consider, for instance, how even the relatively low inflation rates in recent decades have increased prices by 50 percent since 1996. Another thing our brains do, Madrian says, is look at cost savings in relative terms. The phenomenon, impressively named the Weber-Fechner law of psychophysics, can make saving hundreds of dollars seem less worthwhile than saving $10. "If a store is offering a discount — you know, $10 on a $30 pair of shoes, that's a 33 percent discount — people will drive 20 minutes out of their way to get that discount, because it's a big relative difference in price," she says. "Whereas they might not drive 20 minutes out of their way to save $300 on a car if that $300 is only 1 percent of the price of a car, because 1 percent seems small." The federal government is hoping that its new mortgage tools can help break through these mental blocks to convince Americans just how valuable .5 percent can be — and give them a better chance to realize those thousands of dollars in savings.